This is a bit of play painting I did using the book ‘Celebrate your creative self’ by Mary Todd Beam. 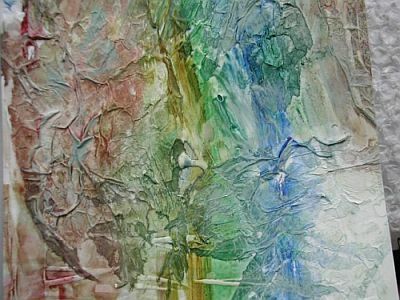 It is gesso with tissue paper torn and pressed on top of it, then painted with acrylic paints when that dried. It was fun to do. Not sure if it should be this way up or maybe with the blue at the top to make it like a landscape painting? Well, I picked up my laptop and turned it sideways… I like the current orientation better.